Create a new category for it (be sure to uncheck the box that includes the category in random before you save it so it isn't posted at random times throughout the year). Add your content about the event to that category. When you'd like to start posting about the event, put some time slots on the schedule for that category. When the event is over, remove those time slots from the schedule. Edgar will hold the content in your event category for you. And when that event or season rolls around next year, just put the category back on your schedule again for Facebook and LinkedIn. There's no need to recreate seasonal or event content every. single. year. If you have content you'd like to add or keep in your Library, but you're not ready to publish it right now, you can create a holding category for it. For example, maybe the content needs approval from another team member, it's in draft form, or you just want to keep it for later. Click the Add New Category button on the Categories page. Add a name for your category (for example, "Holding" or "For Review") and be sure to uncheck the box that includes the category in random (this step is very important to prevent Edgar from publishing this category for Random time slots). Save your category and you're done! Add content to your holding category(ies) as needed. 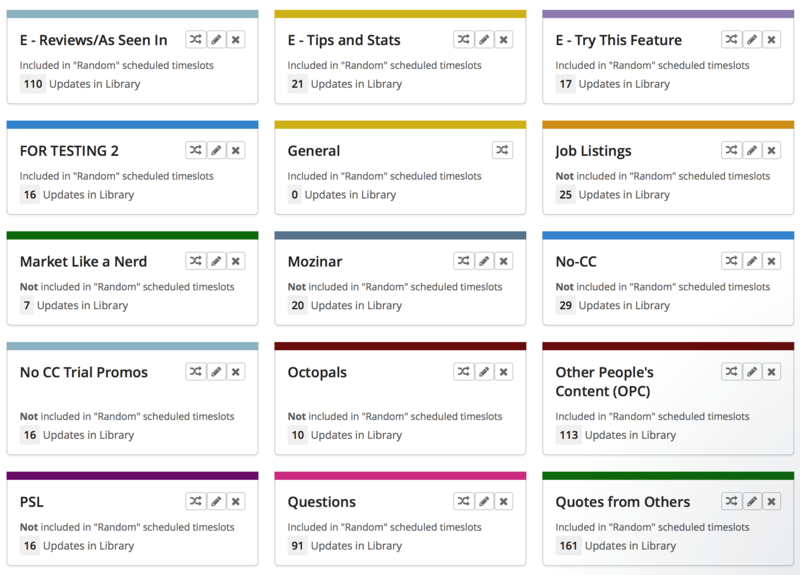 And when you're ready to use it, just move it to one of your active categories. While we still use the default categories for general topics, we create custom categories for more specific topics in our own Edgar account. Creating custom categories allows us to post about very specific topics at very specific times by adding those categories to our schedule when those topics become relevant. And it makes it easy to store posts in specific locations for future use. For example, in the screenshot above, we have custom categories for Job Listings, a webinar we did with Mozinar, different types of posts about Edgar, and questions we like to ask our followers, to name a few. Some of these categories remain on our schedule year round because they're always relevant, while others may come and go depending on whether we're actively promoting that content at the moment. By creating a custom category for each event or topic, we're able to keep all of our content organized and available in our Library for when we need it. Have questions? Message the customer experience team by clicking on the speech bubble to the right!